Is it really worth upgrading to a dual CPU liquid cooler? You may be asking this question, and so today, we will answer that by talking about the dual CPU liquid cooler and its wide array of benefits. 1 What is a Dual CPU Liquid Cooler? 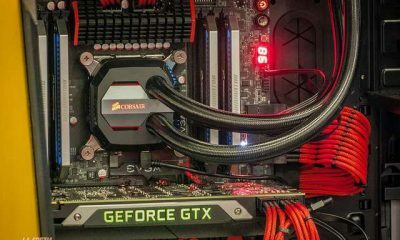 What is a Dual CPU Liquid Cooler? Simply put, this kit is a liquid cooler with wider radiators (240mm or 280mm) and dual fans for extra cooling capacity. Compared to a conventional air cooling system or a single CPU rig, the dual CPU liquid cooler has the potential to perform twice as better. In fact, its amazing features make this particular kind of product highly recommended. Some of the best dual CPU liquid coolers include CORSAIR HYDRO SERIES H100i v2 AIO Liquid CPU Cooler and Thermaltake WATER 3.0 Dual Riing RGB High Static Pressure Fans 240 AIO Water Cooling System CPU Cooler. This product from Thermaltake is an example of a dual CPU liquid cooler. Bigger coolers, more fans with RGB lighting – your rig will instantly become an eye candy so immaculate that it’s worthy to be displayed in a gaming convention or exhibit. Most kits of this size are customizable. They give you more options to go DIY and expand your loop with additional tubing and pumps, making your rig look like a beast. Based on raw cooling performance alone, the temperature difference between a 120mm and 240mm CPU liquid cooler is like night and day. To be exact, in most tests, the difference peaks at 14 degrees Celsius with the same overclocking and voltage. The dual CPU liquid cooler (both 240 and 280 variants) leads the overclocking load cooling charts because of better airflow and better dissipation of rendering heat. In countries with tropical climates, this type of cooling power is like a gift from the CPU cooling gods. Despite having dual fans, the load noise level in a dual CPU liquid cooler is barely audible. Even at full load and high RPM, you’d only hear the low hums of your fans. Even the pumps are quiet! There’s not much of a difference between the 120mm and the 240mm when it comes to noise. This means more cooling power for the same near-silent load noise levels. As long as you take care of the liquid CPU cooler, you can maintain the low level of noise inside the CPU. You never have to worry anymore about burning out your CPU when you want to maximize your gaming experience. Some tests have pushed the clocks even further at 5Ghz playing games with maxed out graphics. Overclocking has never been more enjoyable and worry-free. Gamers will be able to enjoy this privilege, while graphic designers, architects, video editors, and 3D modelers can clock their CPUs at higher rates to speed up the rendering process. What’s great with most liquid cooling systems is that you don’t have to worry about regular maintenance of the internal parts. However, it doesn’t mean that you don’t have to clean your CPU. For starters, clean the radiator fins and CPU grill by blowing compressed air. In case you feel like the system isn’t as efficient as before, have your dual CPU liquid cooler checked by a professional computer technician. As soon as you discover any form of a leak from the CPU, turn off the computer and fix the problem ASAP. You don’t want the internal CPU components to pick up moisture from the liquid coolant. What good is a liquid CPU cooler if you place it under the direct heat of the sun? Aside from putting the computer indoors, check if you can regulate the temperature of the room. If you want to take overclocking to the next level, and see how far your CPU can perform without the limitations of heat – and especially if you have extra cash to shell out – then, by all means, go for the dual CPU liquid cooler.